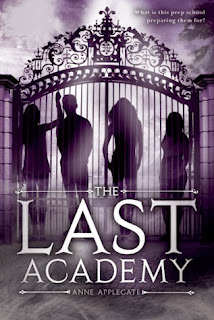 Anne Applegate is the author of THE LAST ACADEMY as well as this little blurb right here. She always thought writing about herself in third person would feel pretentious and weird, but it turns out she kind of enjoys it. Great mystery and possible paranormal activities sounds great!! Ive wanted to read this book for a long time since it 1st came out!!!!! I really hope i win!!! My favorite part of the summary is "plagued by odd memories, and senses there might be something dark and terrible brewing" thanks for the great giveaway! I really like the secrets and mystery. I like that it's paranormal and at a boarding school. The name of the school is intriguing too. The entire thing! This was one of my favorite books last year. Sadly I borrowed it from the library. I dont regret reading it but i am sad i don't own it. The mystery of it all!